I enjoy conservation because it seems like a great use of land. We get to use the resources from the land, yet do not take so much away from it that future generations can not use it. Forests are a great example of this. 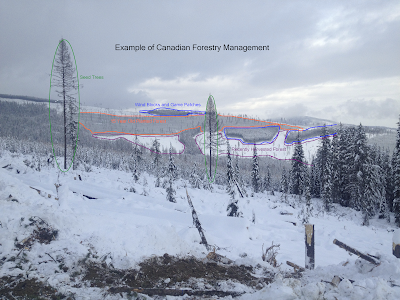 On my recent trip to Canada we visited a logging site and the view behind us of the government owned hillside was a great example of conservation in action. See what I mean? The tops of ridges are left intact to act as wind blocks for soil erosion so that newly planted tree saplings are not uprooted. They are also left intact so that animals have places to run and forage. The rest of the forests are cut in patch style rotations so that trees of three or more ages are in one place. 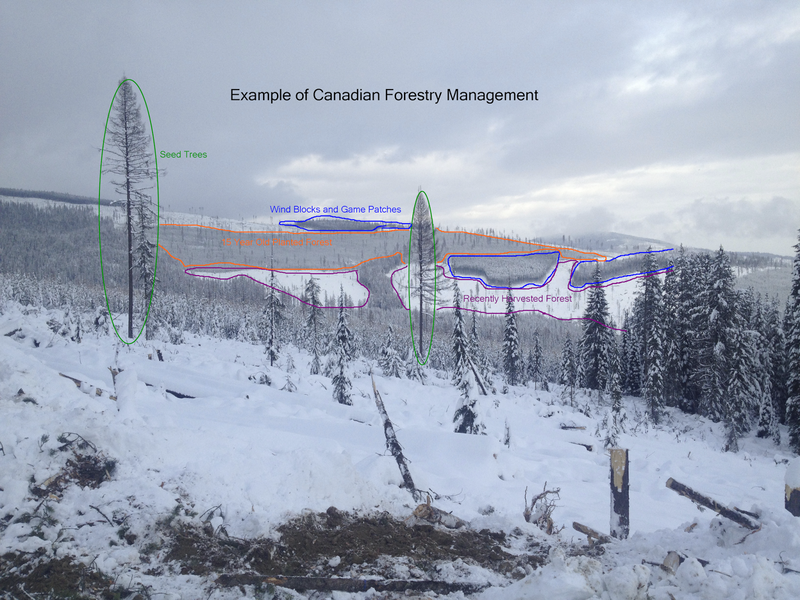 For example, in the immediate foreground the trees were cut in the last week, about 200 meters away the trees were in the 10-15 year old range, and on the opposing hillside I have labels for the different areas. Seed trees are also left every 30 meters or so to help reseed the forest and act as land stabilizers as the young hand planted saplings take root. The sapling trees are all planed by hand by seasonal workers in the summer. The large seed trees left are of the type that is most productive for lumber. The smaller trees left, seen in the foreground and of varying species, were trees too small for any economic use so they were left, run over several times, but otherwise undisturbed. When I explain the exploitation, conservation, preservation continuum to people, often people think think of one extreme or the other, but between removing every single tree and not removing any of the trees is a medium that is economically productive, on land that aside from hunting is otherwise economically unproductive. The negative aspect is that in this part of British Columbia the trees are in the neighborhood of 70 years old when they are harvested. With growing cycles that long sustainability takes on a complex meaning. It is good to know that somewhere in the world people are attempting to plan environmental practices decades into the future, and not only for the sake of recreation, but for an economic benefit, every year. Finally, it is worth noting that increases in carbon dioxide levels and rising global temperatures will increase the rate of growth of northern (and I suppose far southern) trees. In other words, the CO2 levels have gone from about 310 ppm to 390 ppm from 1960 to 2010 so a 70 year cycle in the past might only be a 50 year cycle going forward. The negative of this is that the wood will be less dense, and thus a slightly lower quality. The positive is, there will be more wood available to harvest. In a perverse way higher CO2 levels and warmer temperatures will help the logging industry reduce the time between harvest cycles. Clearly, forestry, and wood, paper and related products, are one tiny aspect of the global resource pool yet a complicated topic whose best practices we are still learning. In short, Canadians, nice job, it seems like you are thinking about all of these things in a proactive manner!